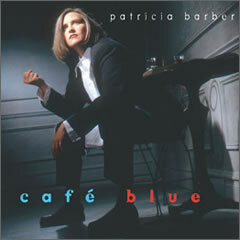 For the first time, Premonition Records is releasing Patricia Barber's audiophile classic, café blue, on open reel analog tape: two 1/4" reels (10.5 inch) at 15 ips IEC (CCIR). This version of café blue was remixed by the original recording engineer, Jim Anderson, at Capitol Studios in Hollywood in 2011. Utilizing Capitol's one-of-a-kind reverb chambers and EMT plate reverbs, as well as its classic Neve console, the remix delivered "sharper acoustic details, less reverb on Barber's voice, and a more assertive bass presence," according to Stereophile Magazine in its 5 star (SONICS) review of the 180-gram LP re-issue. The Master tape supplied was a 1/2" NAB 15ips and was recorded at a true "0" level using Dolby SR. This tape was played on the Mastering Lab MCI using proprietary tube electronics designed by Sherwood Sax. A modified Dolby fed The Mastering Lab Console. Output was fed to an ATR 102 at 15ips using the IEC record curve. All tape was manufactured by ATR. Each (blank) tape is copied from The Mastering Lab's production master played on a custom-built studio master ATR Services Ampex 102 through hand made Aria electronics. Custom wire is employed between the Ampex Aria electronics and a Studer 820A recorder where each 1/4" tape copy is recorded at 15ips IEC (CCIR) and 250 nanowebers. The tape machines are powered by special power cords plugged into hand-built line conditioners made especially for this application. Each tape machine is set on special acoustic fee to isolate the chasis from vibration. This release brings the listener to within two generations of the original master tapes. Premonition's President Michael Friedman says, "I've always marveled at the sound of our recordings as I first experience them in the recording studio during our mixing sessions. I'm really happy to now offer listeners a window into that experience." The two reels are packaged in ATR Magnetics Tape Care boxes for maximum protection and include custom labeling and inserts. Orders will be shipped via USPS Priority Mail within 30 days of the order date, if not sooner. Premonition's FAQ regarding shipping outside the U.S. will not apply to this particular release as all tape shipments will include a tracking number. To purchase, click the "Select Analog Tape" box above and choose shipping location. And then click "Buy." Price includes shipping.